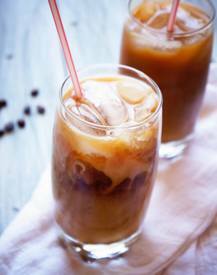 There are a few different ways to get your hands on a glass of iced coffee, the official caffeinated beverage of summer. You can go out and buy one, but everyone knows it's priced way too high. Another option is to have the foresight to make a batch of cold brew at home, but that means thinking about what you're going to drink tomorrow, today which is very unlikely. There's the quickie method of brewing hot coffee on cold iced cubes. It works, but if not done correctly it's basically just watered down, lukewarm coffee. So, in other words, gross. Or, there's this other option. A really good one. One that lets you make a gallon (or less) of good iced coffee in just 15 minutes. How is this possible you ask? It's all about the ice bath.